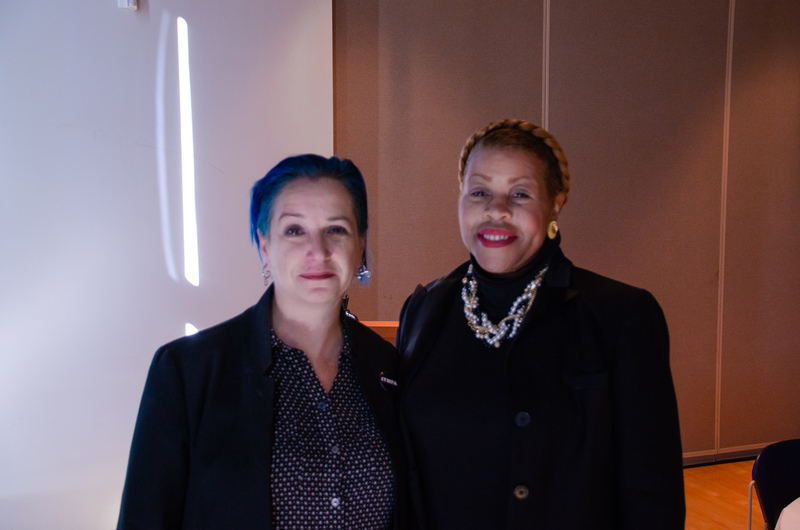 Instructor of Gender Studies Helen Boyd Kramer with Vice President for Diversity and Inclusion Kimberly Barrett. With the goal to educate students, faculty, staff and other community members about topics that will help the local and global community work together, the Office of Diversity and Inclusion sponsored a lecture called “Smash the Binary” on Tuesday, Oct. 16, at 11:15 a.m. in the Esch Hurvis Room of Warch Campus Center. The speaker was Instructor of Gender Studies Helen Boyd Kramer. Boyd Kramer introduced her lecture as a “cultural competency workshop” to discuss non-binary genders. In her lecture, she not only discussed how to be inclusive and welcoming to others, but also the relevance of different genders throughout history. Although the spectrum of gender identities and expressions is seen as a new phenomenon to many, Boyd Kramer mentioned the different cultures and time periods in which it has been a topic of discussion, for she claims there has always been gender unrest. In the 1850s, there were cross-dressers in order to obtain opportunities presented exclusively to men. During the 1920s, the flappers were a source of great sexual and gender unrest, and the word “androgynous” became common in the ‘60s and ‘70s. During the ‘80s, gender neutrality became known. Boyd Kramer also mentioned the different cultures, which not only simply tolerate diversity of genders but also recognize it. The Christianized west is the only culture, according to Boyd Kramer, that has yet to acknowledge more than two genders. Boyd Kramer provided evidence of multiple genders in the Bible, which furthered her emphasis on the irregularity of the Christianized West not acknowledging more genders. The Bible recognizes multiple genders in its recognition of eunuchs — men who have been castrated young enough for it to affect their hormones. Despite the presence of multiple genders throughout history and across the world, the U.S. still struggles with recognizing and accepting all peoples. Speaking from personal experience, Boyd Kramer described the feeling of invisibility that marginalized people often experience. This invisibility is discarded only when harassed or stared at. When it comes to interacting with people of different genders, Boyd Kramer calls audience members to have kind and welcoming intentions, even if it means being a bit awkward. Assuming someone’s gender is worse than just awkwardly asking. When discussing assumptions, Boyd Kramer also reminded people that gender is not an indicator of sexuality; they are not one in the same. Other than avoiding assumptions, Boyd Kramer also provided advice for the Lawrence University faculty and staff as well. Rather than having students go around the room and introducing themselves and their preferred pronouns, Boyd Kramer recommended being more discreet, for there is no need to expose non-binary students. Because of the wide variance and great number of genders, the value of separate housing for different genders is unnecessary in Boyd Kramer’s eyes. She explained that the younger generation simply does not care. According to Boyd Kramer, “Millennials understand.” It’s the older generations that are struggling. Despite the many issues acknowledged by the lecture, it still concluded on an optimistic note. Discussions about non-binary people started with a couple private message boards online, according to Boyd Kramer. Now, there is so much information. From the website Everyday Feminism to Boyd Kramer’s own books, there is a surplus of information out there. Although the lecture presented serious and complex issues within the global and local community, Boyd Kramer’s advice was simple. Whenever experiencing questions or a lack of confidence in a situation, Boyd Kramer reminded the audience, “We all have genders. We’re all awkward.” She explained that gender is a spectrum, not binary. According to Boyd Kramer, it can be awkward, but that’s okay.